Mark Morris has been hailed as the “the most successful and influential choreographer alive, and indisputably the most musical” (New York Times). In addition to creating over 150 works for the Mark Morris Dance Group, he conducts orchestras, directs opera, and choreographs for ballet companies worldwide. Morris’ work is acclaimed for its ingenuity, musicality, wit, and humanity. Named a Fellow of the MacArthur Foundation in 1991, he has received eleven honorary doctorates to date and a multitude of awards, including the Samuel H. Scripps/American Dance Festival Award for Lifetime Achievement, the Leonard Bernstein Lifetime Achievement Award for the Elevation of Music in Society, the Benjamin Franklin Laureate Prize for Creativity, the Cal Performances Award of Distinction in the Performing Arts, the Orchestra of St. Luke’s Gift of Music Award, and the 2016 Doris Duke Artist Award. In 2015, Morris was inducted into the National Museum of Dance in Saratoga Springs, New York. 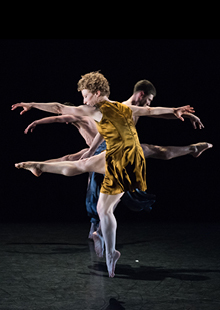 Formed in 1980, the internationally-renowned Mark Morris Dance Group (MMDG) has received “highest praise for their technical aplomb, their musicality, and their sheer human authenticity” (Bloomberg News). Live music and community engagement are vital components of the Dance Group. It has toured with its own musicians, the MMDG Music Ensemble, since 1996, and regularly collaborates with orchestras and opera companies around the world. MMDG’s film and television projects include Dido and Aeneas, The Hard Nut, Falling Down Stairs, the U.K.’s South Bank Show, and Live from Lincoln Center. In 2015 Morris’ signature work L’Allegro, il Penseroso ed il Moderato premiered on PBS’ Great Performances.